Christmas is over, the New Year has started and many of us are starting to recognize that the jeans sit a little tighter and the belly got a little rounder. What is most commonly known as After-Holiday-Shape is absolutely no reason to worry, though. With January skies – grey and grim – looming over our heads and icy streets beneath our feet however, jogging and biking are out of the question to get ready for Spring. Czechs are very active folks and have found the perfect winter activity that will burn the extra calories you might have munched on and will make you feel back to your old self in no time. Cross Country Skiing might just be the unofficial National Sport of Czech Republic. While Austria and Switzerland shine with steep hills, masses of snow and great downhill skiing conditions, Czech Republic definitely wins the race of the nicest Cross Country Skiing Tracks. Not too steep, long and with stunning views, Czechia’s slopes take every Cross Country Skier in their ban. 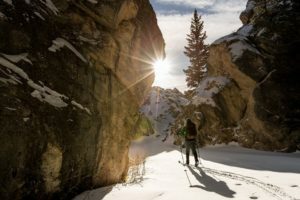 Having been used hundred and thousands of years ago by our Scandinavian neighbors, Cross Country Skiing seized to be a transportation system and instead became a fun and more secure activity than Downhill Skiing. Cross Country Skis are built wider and allow you to move evenly uphill with your skis – which with normal skis is just not as fun and easy. Another, very important difference: Cross Country Skiers get to wear comfortable shoes. 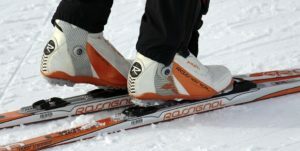 In Cross Country Skiing, the toe of the ski boot is clipped to the binding, which allows you to rise your heel from the ski. In Alpine Skiing on the other hand, this would result in some very bad accidents; as you would slide around when going downhill. Cross Country Skiing knows two main styles: Classic and Skating. While the latter sounds cooler when telling your friends about it, you might want to start with the Classic style before moving on to Skating. But what are the differences between the two? Uses wider skis that allow you to push off onto the forward gliding skis. The Classic Style is especially suitable for beginners, because they can get accustomed to the feel and boost their confidence by ‘walking on their skis’ until they can hold their balance and figured out how to ‘kick and glide’. The Skate Style is popular with runners, cyclists and even kayakers as a cross training activity. Everybody that is now trying to get into their ski suit, please get out of it again. While yes, Cross Country Skiing is an activity in the snow, no you do not need to dress like a skier. This might sound anything but right, but due to you sweating loads when Cross Country Skiing, you would get way too hot, if you are going in your ski dress. Instead, opt out for layers consisting of long sleeve tech shirts, running pants, as well as a soft shell or other weatherproof jacket in case you fall. Of course, the hat, mittens and scarf can and should accompany you to the mountain. You can rent the special skis in all Cross Country Skiing regions upon arrival. If you want to gear up in the city already, so you can skip the queues in the resorts or if you would just like to go Cross Country Skiing in the capital, there is loads of rental places to choose from. CZ SKI is especially well equipped and their staff will happily help you find the perfect skis for your Cross Country Skiing adventure. If you are a newcomer to Cross Country Skiing and do not want to get too far out of the City to try the sport, Velka Chuchle’s artificial Cross Country Skiing Trails might just be the right thing for you! The horse racecourse in Velka Chuchle is open and for free for Cross Country Skiing whenever the temperatures drop below zero and thus no horse races are on. The best part? They have a rental place, too, so you do not need to schlep your gear to Prague 5! 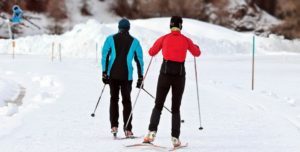 Unfortunately, this winter has not been so gracious with snow so far; whenever the snow sticks around though, the many parks of Prague offer a great opportunity for beginner Cross Country Skiers to try out their gear and get into the groove. 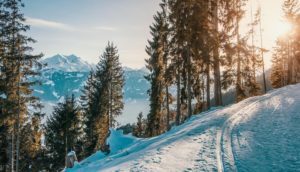 If you managed to get the hang of Cross Country Skiing, are a Pro or an unafraid beginner you might want to look out for some places to ski in out of the city. Jizerske Hory is often named the Mecca of Cross Country Skiers and offers wonderful tracks along with stunning nature to discover. Over 180 kilometers of snowy Highways are yours to discover and have fun on right on the Polish Border. The region can be reached from several points (Bedřichova, Jizerky, Oldřichov, Desna, upper Polubny or Martin Valley in Kořenov). Cross Country Skiing in the protected nature area of the Giant Mountains is an absolute gorgeous experience. Skiers can also run on trails on the Polish side of the mountain (Bieg Piastów in Jakuszyce), thanks to close cooperation between the two ski regions. Jizerske Hory also has the longest history of grooming trails – having started with it in 1984. If you are a Cross Country Skier, you might also be interested in their annual Cross Country Skiing race “Jizerská padesátka”. It is held on the 170 kilometer long route “Jizerska magistrala”. The protected landscape of Šumava is a well-sought after region for hikers in summer. In winter, gentle uphill slopes and marvelous nature invite Cross Country Skiers to spend some time in the Southwest of Czech Republic. Because the region is almost 1’000 meters above sea, the snow conditions are usually good through most of the winter months. 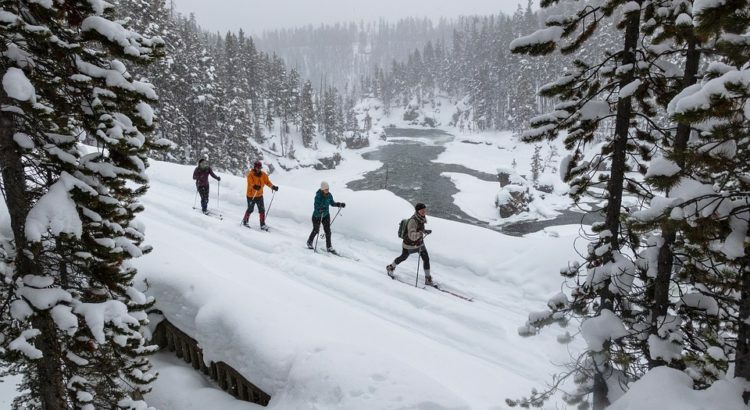 Especially the tracks by the canal offer a great Cross Country Skiing experience for everyone that wants to learn the sport or just take in the beautiful nature while wading through the snow. The slopes are very easy and thus not made for top class sportsmen. 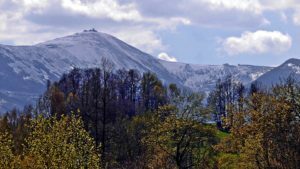 Šumava’s network of ski trails measures a total of 450 kilometers, whereas 320 kilometers of the trails are maintained by snowmobiles. An especially nice region to ski in is Železná Ruda. And of course, hot drinks are offered by ski bars along the trails plenty. 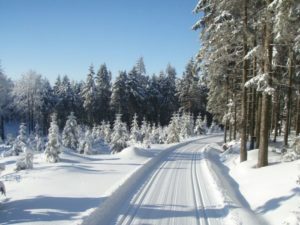 The main trail for Cross Country Skiing in the Southwest connects Železná Ruda and Lipno. The 140 kilometer long slope brings you to 400 kilometer of local, groomed trails and not to forget the stunning nature area of Lipno. Sunsets over Lipno lake are simply magnificent and if you fancy some more walking on higher altitude while in Lipno, be sure to check out the Treetop Walkway. Are you keen to test your Cross Country Skills? Then Vysočina’s cross-country racing circuit – which formerly hosted world cup races – is for you! Of course, there is also trails and tracks for beginner and amateur cross country skiers in the region of Žďárské vrchy (nestled between Brno and Prague). Dubbed by many as ‘the promised land for cross country skiing’, the 50 kilometers long, well maintained tracks surrounding Žďár nad Sázavou will take visitors in their ban. An additional 80 kilometers of groomed trails lie north of the region – primarily around Velké Dářko. The Radotínský, Račínský, Městský, Škrdlovský, and Světnovský circuits link up with the cross-country trails of the Žďár, Nové Město, an Ždírec regions. Welcome to the Cross Country Paradise! Take in stunning views, ski on more than 500 kilometers of local ski tracks and circuits and enjoy the phenomenal snow conditions. Krkonoše’s very popular main trail is “Magistrála”. The 71 kilometers long track leads directly through the mountains. Imagine all the views! If you want to test your racing skills, maybe give the central part of the Krkonoše Mountains – Misečky – a try. The Cross Country Ski Trails near Špindlerův Mlýn meet FIS standards and will prepare you for your next – or first? – race. These are our favourite places in Czech Republic for Cross Country Skiing. However, there is always more gems and hidden places to discover. So get on your skies, put on something warm and explore the white trails of Czech Republic! 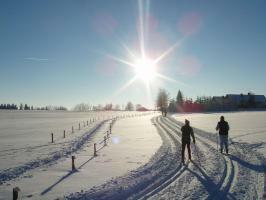 Have you tried Cross Country Skiing around Czech Republic or in some other place? Have you explored the places above or have other hidden places to Cross Country Ski in Czech Republic? Tell us all about it in the comments!